Israeli aircraft blasted the Palestinian prime minister's office early Sunday during the fifth straight night of airstrikes aimed at winning the freedom of an Israeli soldier held captive by Hamas militants in Gaza. An Israeli Cabinet minister said the attack was aimed at harming the Hamas government's ability to rule, reports CBS News correspondent Robert Berger in Jeruslaem. The attack on Ismail Haniyeh's empty office came amid continued diplomatic efforts involving Egypt and other regional players to end the standoff, which have been under way since Cpl. Gilad Shalit, 19, was seized a week ago in a cross-border raid. Israeli Prime Minister Ehud Olmert and Defense Minister Amir Peretz were to meet with security officials later Sunday to discuss whether to give diplomacy more time or to escalate the military operation. Late last week, Olmert called off plans to broaden the Israeli incursion from southern Gaza to the coastal strip's north in a nod to the diplomatic activity. On Sunday, he hinted at possible escalation when he said his government had instructed the military to "do all it can" to return Shalit safely. Palestinians said two missiles fired by attack helicopters set Haniyeh's office ablaze, but it was empty because of the late hour, witnesses said. One bystander was slightly injured. Inspecting the wreckage, Haniyeh called the attack senseless. "They have targeted a symbol for the Palestinian people," he said. The Israeli military said, however, it would "employ all means at its disposal ... to secure the safe return" of Shalit. Roni Bar-On, an Israeli Cabinet minister, said the attack was also meant to "compromise the Hamas government's ability to rule." "We will strike and will continue to strike at [Hamas'] institutions," he said. "They have to understand that we will not continue to let them run amok." Hamas, whose charter calls for Israel's destruction, took power after winning Palestinian parliamentary elections in January. Although Israel has said repeatedly in the past that Haniyeh could be a target for assassination, the gunmen holding Shalit are thought to take their orders from Hamas' Syria-based political chief, Khaled Mashaal, so the attack on Haniyeh's office appeared to be more symbolic than aimed at killing him. In other airstrikes after midnight, Israeli aircraft hit a school in Gaza City and Hamas facilities in northern Gaza, where a Hamas militant was killed and another wounded, Palestinian officials said. The military said the two were "planning terror attacks against Israel." 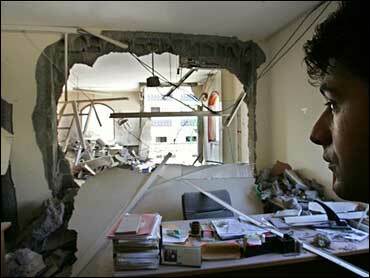 The 34-year-old Hamas gunman, Shaaban Manoun, was the second militant killed in the offensive. Exerting pressure on Hamas from various directions, Israel continued to hold 64 Hamas leaders, including eight Cabinet ministers, rounded up in the West Bank on Thursday. Military officials said the government would bring the detainees to court by midweek to seek permission to extend their detention. After the Israeli airstrike on his office, Haniyeh met with Palestinian President Mahmoud Abbas for an hour to discuss the Israeli attacks and efforts to keep the government functioning despite the arrests, the prime minister's office said. In a statement, Haniyeh called for foreign intervention to stop the Israeli offensive. "The international community must shoulder its responsibility," he said. Israel, meanwhile, planned to reopen its main cargo crossing with Gaza later Sunday to allow food and medical supplies to reach the impoverished strip, the Defense Ministry said. The Karni passage, sealed after the militant attack, will be open four days this week, the ministry said. While food shortages have not been reported, human rights groups have cautioned that Gaza could face a humanitarian crisis because nearly half the territory's electricity supply was knocked out after Israeli missiles struck Gaza's only power station. Israel has since increased its supply of electricity to Gaza, the Israeli army said Saturday. Fuel supplies were also dwindling after Israel cut off the flow to Gaza through a pipeline. Israel Radio reported that a separate crossing in southern Israel would be opened later Sunday to allow fuel through, but the Defense Ministry did not confirm this. On Saturday, Hamas demanded the release of more than 1,000 prisoners held by Israel and a halt to the offensive, but Israel rejected the conditions out of hand. On Sunday, Bar-On reiterated that Israel wouldn't negotiate Shalit's release. Hamas government spokesman Ghazi Hamad urged Israel to be more flexible. "I think that if the Israeli government will understand that it's possible to release prisoners, things will end OK," Hamad told Army Radio. "If not, I think the situation will be very difficult for us and for you, too. ... Maybe there will be a [military] escalation and people will die." Peretz met with senior security officials Saturday night and then called U.S. Secretary of State Condoleezza Rice to urge the Bush administration to step up pressure on Syria to work for Shalit's release, Israeli officials said on condition of anonymity because they were not authorized to make a formal statement. Prime Minister Recep Tayyip Erdogan of Turkey, a predominantly Muslim country that has close ties with Israel, called President Bush on Saturday and talked for 30 minutes about the crisis. "The president said that the initial goal should be freeing the Israeli soldier - that is the key to ending the crisis," said Frederick Jones, spokesman for the National Security Council at the White House.